The Historic Clifton Mill Restaurant offers the atmosphere of yesteryear. Sit back and relax to the gentle sounds of the old mill wheel and the soft rhythm of the water gently cascading over the falls. Gaze out at some of the country’s most beautiful natural scenery, Clifton Gorge and the Little Miami River. 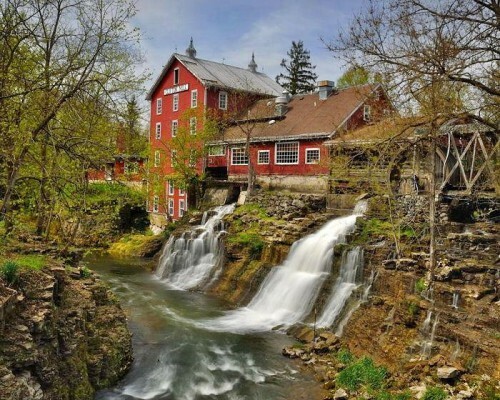 The restaurant inside Historic Clifton Mill will serve you a truly home cooked meal. Fresh whole grain breads, pies and cookies are baked daily. Our flours and pancake mixes are available for purchase in the Country Store or in our Gift Shop. Serving breakfast, lunch and dinner with reduced winter hours for dinner. Reservations for large group recommended. Legendary Lights of Clifton Mill: Nov 23-Dec 31. Grounds open 5-9p, lights on at 6. $10, Children 6 and under free. Open 6-8p on 12/23, 25 & 31. Snack Bar & Hot Cocoa.